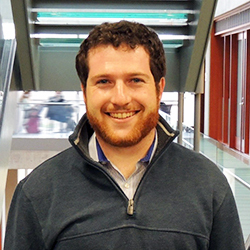 Chemical engineering senior Matthew Amrofell completed his co-op with Baxter Healthcare as a member of a research and development project team, and he had the unusual chance to work as a supervisor. Selected as Northwestern Engineering’s 2017 Walter P. Murphy Cooperative Engineering Education Student of the Year, Amrofell recently sat down to chat with Engineering Career Development about his work, volunteering, and the benefits of doing a co-op. How do you feel your co-op experience has shaped you as an engineer and person? The co-op experience is a great way to see the practical side of engineering combined with the traditional classroom learning experience. As a student, I was able to get that practical experience as well as learn some of those soft skills like how to be a leader in a corporate environment, how to delegate work, how to work with people who have very different work styles, and more. Tell me what it was like to act as the interim replacement for your supervisor, Sarah Mathiot, a principal systems engineer when she was out for three months on maternity leave. What was the level of responsibility? How did this opportunity change and impact your overall co-op experience? It was a little nerve racking at first, but I transitioned into the role well. Stepping into my supervisor’s position for the interim was definitely more responsibility than my first co-op term. During my first co-op, I was a jack of all trades, completing a variety of tasks given to me by my team. However, in this new role, I had long term responsibility and knew what my work entailed for the entirety of my co-op stint. I was fitting into a niche rather than getting one-off, short-term projects. For an example, the research and development process I coordinated involved several moving parts. There were multiple companies involved in several aspects of the process, including manufacturing and product reliability. What was it like to work alongside senior and seasoned engineers? It was a great experience but also a bit complicated to manage what it meant to be a co-op while being in a position of authority. On the one hand, I was always trying to learn as much as I could from my team who were very experienced in the industry. On the other hand, I had to take on a leadership role. Although complicated, my manager was very impressed with how I handled it, and I got along well with all the other people on my team. You have been involved with several community service initiatives and projects both in local communities and Northwestern’s community. What made you decide to take on extra projects, and what did it add to your experience? Tell me a little bit about why you chose the projects/organizations you did. Initially, I wanted to give back to the Engineering Career Development office that had helped me secure my co-op, so I volunteered for an interview day. I really liked it, and I thought that everyone in the office got along really well, and it was a fun group. I liked it so much that I became the office’s work-study student. I also volunteered with a couple community service projects with Baxter during the summers. The teams picked local non-profit organizations that they wanted to work with and both summers we worked with Providing Advocacy, Dignity and Shelter or PADS. PADS is a resource for homeless people that provides temporary shelter as well as access to resources and services as they relate to finding a job. The first project we did was a career workshop for recently rehoused adults. We also did a STEM workshop for their children. The next year, we redesigned how PADS processed donations. Formerly, it had been done on paper. We created and transitioned the donation process to an electronic form with required fields, which enabled more complete and accurate information to be obtained for the organization. I really appreciated how Baxter uses its people’s specialized skills to then impact the greater community. This quality is something I have been looking for when pursuing full-time employment after graduation. Like all students in the co-op program, you alternate between classes at Northwestern and your co-op job at Baxter. What would you say were the challenges and benefits? Well the challenge was definitely coordinating with the chemical engineering curriculum. This curriculum has a lot of classes that are only offered once or twice a year. A lot of them are a pre-requisite for something else making it a bit more challenging. On the other hand, a benefit was that I get to stay in school longer without paying extra tuition. Being in school longer is great, because I get to indulge in my passions for a greater period of time such as being a part of the ski team here at Northwestern. It is also nice to have a break from finals every quarter when I was working during my co-op and have the opportunity to spread out my class work a bit more. Getting the opportunity to make money throughout college as a co-op is a great benefit as well. What would you tell a first time co-op student about how to prepare for the work place environment? I would say definitely go in with the intent to ask a lot of questions. Your team will know that you are not familiar with the work and the industry and that you are still in college. This way you can learn a lot more about your project and about your discipline from people who have experience in the field. I would also say be flexible. You’re not going to necessarily get the work that you want right away but if you do the work you’ve been given well and make connections within the company, you are likely to transition to something that’s more related to what you want to do. That’s what I did personally and it definitely helped me. Another thing to know is that time tables are a lot less independent. In college, you have due dates and you can choose to spread out your work or do it all the night before. However, at work you do not have the same leisure. Your boss will not be happy if you don’t do work for two days and finish all of your work for that week in one day. So it is important to understand that timing is a little more structured, and there are constrains to the workday. What would you say to students who are on the fence about doing a co-op? It’s definitely worth it! You gain a lot of work experience, which future employers will love. It is also nice to get paid and not have to pay for tuition. The pros definitely outweigh the cons. What was the greatest thing, or most surprising thing, that you learned about yourself throughout your time as a co-op? I learned that I’m able to pick up technical things really quickly when the need arises. My first team was an electro-mechanical systems engineering team, which isn't related to my chemical engineering background. I was able to figure out and intuit things well. I also learned that; although, I was in in an environment where I was not necessarily familiar with the technology, I was still able to be a leader.